image, we would love to hear from you. Contact us. Beneath the place where the two arms of the Washington National Cathedral cross, there lies a crypt dedicated to Joseph of Arimathea, and the cathedra, the Bishop's chair, is made of stone sent over from Glastonbury Abbey by Stanley Austin. 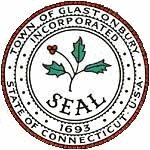 In the mid 1600's, a small group of people began to work the land and a few decades later the township of Glassenbury began to take shape. "Glistening Town", from the Anglo-Saxon, tied them directly to Glastonbury in England. The spelling of the town's name varied until the mid-1800's when it was decided to conform to the "proper" English spelling. The thorn on their town seal is a replication of the Somerset thorn, which visually links them to their European past. Glastonbury is well known for its picturesque farms, orchards, streams, and woods. Like Glastonbury, England, apple trees can be seen in abundance and an Apple Harvest Festival takes place annually. Glastonbury Partners in Planting Inc began a project to propagate a Glastonbury Thorn for the Town's use using a graft from the Thorn at the National Cathedral in Washington, D.C. In 1938 Katherine Maltwood, (re-discoverer of The Glastonbury Zodiac) and her husband, John, emigrated to Canada. They took with them a scion from the Holy Thorn in Glastonbury to plant in their new garden. This tree is now situated adjacent to the Maltwood Museum on the campus of the University of Victoria. In the 1940's, one Dr. Thomas Everett, took a Glastonbury thorn from England to his home in Brooklyn and then donated it to the New York Botanical Garden (Bronx), where it has been growing happily ever since. For those that want to visit, find it located immediately adjacent to the Museum Building. in 1950. A tree grown from a cutting from the Glastonbury Thorn grew here from 1847 until 1990.
found references to the following places. Any further elucidation very warmly welcomed! St. Elizabeth's Episcopal Church, Burien, Washington. George's Episcopal Church, Englewood, Colorado. ...and now let's hop over to Australia. James Austin (1810-1896) was born at Baltonsborough, just outside of Glastonbury Somerset, the fifth son of John Austin. His uncle, James Austin, had been a forced founder of Hobart Town in Australia. In 1825 John Austin's second and fourth sons, Solomon and Josiah, emigrated to Australia and In 1831 Josiah collected his parents; the third son William, James, and Thomas; and his sister Anna,. Their convict pioneer uncle died before they arrived in Hobart, but all benefited by his will. James went on to develop his Avalon freehold and quickly grasped the potential in urban Australian lands. He was an alderman of Geelong's first town council, and in 1851 its second elected mayor. In 1856 he retired and returned to his birthland, Glastonbury. Somerset. Austin's second son took Avalon, and grafted a sculptured bloom of the Holy Thorn into the bluestone homestead with which he replaced the first. This stone from Glastonbury brought. Into the wall of Avalon is wrought. Stay for a moment traveller & view. This link between the old world & the new. 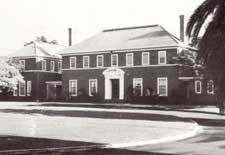 The former Glastonbury Orphanage at Belmont Geeling in Australia, was so named to honour the Austen associations. From Advancing This Good Work, by Donella Jaggs and her daughter Catherine (1988); `A member recalled that we got a piece from Avalon and planted it at the orphanage. It's still there'. Taken from the original Avalon cutting of James Austin's when it grew into a tree. It was struck in the grounds of the property Warrain by the next Frank of the Austin dynasty. This tree thrived for many years until 2001 when, as Geelong botanical historian George Jones says: "It was found to be rotting underground, evidently the result of damage occurring when an adjacent fence was being replaced''. "It was growing at Salt Haven, 72 Francis St, Belmont , formerly the home of Mrs Doris Pidgeon, She told me her mother-in-law, Mrs Florence Bullivant, who was a grand-daughter of James Austin, had visited Glastonbury twice in the 1930s and on one of those occasions brought back a cutting, planting it at Salt Haven. Growing close to the front fence I was able to examine it whenever passing. On October 31, 1999, I noticed a secondary branch had pink flowers, all the others being white.'' George Jones. Geelong Botanic Gardens has two specimens of the Glastonbury Thorn. The second, in the nursery, was retrieved at the last gasp, from 72 Francis St, Belmont, courtesy realtor Ron Arthur, who in 2002 knew the plant's significance and had it excluded from the property's sale at auction in order to be transplanted to gardens. 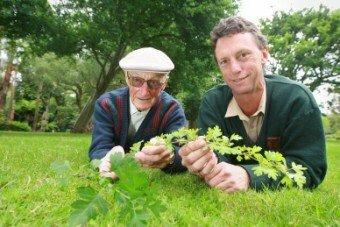 In 2008, Noel Murphy of the Geelong Advertisor, wrote, "It's growing well, and cuttings will be taken in due course and sent to Geelong Grammar to revive fortunes at Avalon."